Elementary teacher Pam Scarpella hands a door prize to Cruz Parker while co-principal Jeff Reprogle announces more prize winners in the background. Elementary teacher Justin Welker organizes a game of musical chairs during Family Game Night Fiesta. 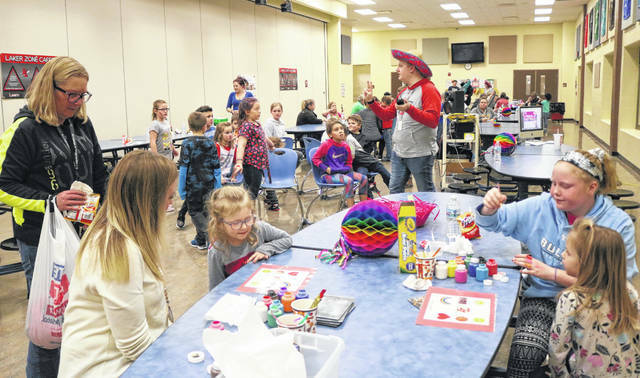 Indian Lake Elementary School turned up the heat with the recent Family Game Night Fiesta. It was the second Family Game Night of the year and organizer Pam Scarpella says they went all out on the party theme to get kids and their families out of the house on a winter night. 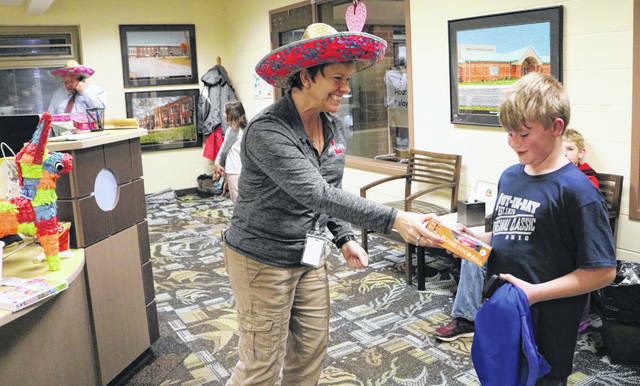 Staff members wore sombreros and served walking tacos, while students and their brothers, sisters, mothers and fathers made heart crowns, tossed rings for soda, played putt-putt, went round for musical chairs, bounced balls and hula-hooped in the hallways, cafeteria and gym. Each student who attended got a book and several students went home with door prizes. Special thanks to Mike Coughlin from Coughlin Concrete for donating money toward the walking tacos and Linda Benedict for donating prizes.